If you are pastoring, performing church management, bookkeeping or accounting functions for a small church, we can help. We invite you to use Working Church absolutely free, for up to 25 members in your small church. Our only requirement is that you (re)register your software with us every few months. That's it. There's nothing 'extra' to buy. There are no hidden gimmicks. To get started, fill out the Demo Request Form. In the last part of the form titled "Comments", tell us you are a small church and you would like to try our free church software. Click Send to submit your demo request. We will immediately reply to your demo request. Then, simply follow the instructions in our return email to you and download the Working Church management software demo. After installing the software you can add your members, your cell groups, small groups and households. Use the software to manage every facet of your church. When the demo expires some months from now, call or email us with your contact information and we'll send you a new authorization key to re-enable your copy of the software. We don't think we can make it any easier than that. To get started, click either the image, or the link, below. Fill out our Demo Request Form and follow the simple instructions you receive in our email. 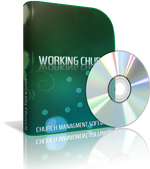 Click here to get Working Church: church management software. Please let us know how we can be of further service to you and your ministries. Thank you for your time visiting with us. We pray that God blesses you and your ministry richly for the service you're providing in building His Kingdom.